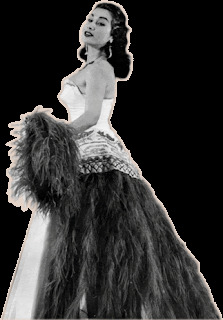 Stephen W. Terrell's (MUSIC) Web Log: THROWBACK THURSDAY: All Hail the Andean Princess of Exotica! THROWBACK THURSDAY: All Hail the Andean Princess of Exotica! So I sat down at my laptop Tuesday morning to Google the meaning of life and I noticed up by the Google logo this picture of a woman in colorful ethnic garb surrounded by musical notes. I didn't recognize the lady and I couldn't figure out what ethnicity her costume represented, So I couldn't resist clicking on her picture. She was born Zoila Augusta Emperatriz Chavarri Del Castillo in the mountains of Peru on Sept. 13, 1922. According to her official website she "is the only singer known to possess close to a staggering 5 octave voice. While less than a handful of singers have managed to capture Sumac's high notes, none have managed to acquire those notes including Sumac's lowest registers. 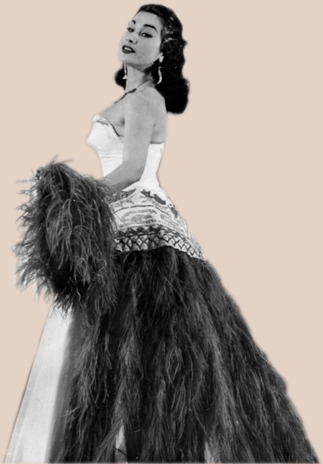 More amazing, is that Yma Sumac had no formal training! It has been said she is unable to read musical notes!" Apparently five octaves really draws out the exclamation points! Around the age of 9 she could often be seen high atop a mountain in the High Andes singing ancient Peruvian folkloric songs, to a group of rocks, which she pretended was her audience. Entranced by the beautiful birds that sang nearby, she began to imitate them, by incorporating their high pitched sounds into her"repertoire." At the age of 13 she began appearing on Argentine radio, which led to a recording career. She and her husband, conductor Moises Vivanco, moved to New York. With her group Inca Taqui Trio she performed on the Arthur Godfrey's television show. According to the Allmusic Guide, the trio "became a fixture on the Borscht Belt circuit and the Catskills." Sumac was discovered by a talent scout from Capitol Records. In 1950 Yma recorded the album Voice of the Xtabay, considered to be a classic in the sound that later would be known as exotic. So what did she sound like? Glad you asked. Here's a song she did in the 1954 Charlton Heston movie called The Secret of the Incas. She did a mambo album in 1954. Here's a song from that called "Five Bottles Mambo." Here she performs a song called "Midnight in Moscow" in a 1960 concert in Russia. This is one from her "psychedelic" album Miracles (1972), which she recorded with bandleader Les Baxter. She appeared on Late Night with David Letterman in 1987. Sumac lived until 2008. She died in Los Angeles at the age of 86.